Organic non-pasteurized milk is my preference but Martin's Country market closed down years ago and was replaced by a car dealership. Yeah for progress! There is nothing like thick, creamy cold milk in a lovely old fashioned glass bottle. Diversity is good and thank heavens for the Amish and Mennonites around here. But fresh milk of that sorts is out of reach at the moment. 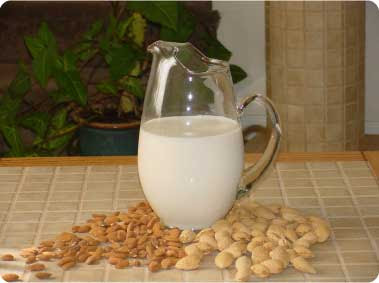 Eventually I switched to Soy milk but the information on its healthfulness is so mixed that I'd rather shy away from it. I've learned that eating large amounts of soy products from NON-fermented soy beans is not a good thing. Something about the mimicking hormones that may not be good for growing boys or grown women for that matter. So then I switched to manufactured rice milk. But even rice milk doesn't sit well with me. Well I decided to go the way of homemade almond milk. So once again I go over to the Mennonite store, not the one that closed down but one located on a small dairy farm where they sell fabric not milk, and I purchased some cheese cloth. I used the cheese cloth to drain/strain my almond milk concoction. Add a little raw sugar (in lieu of the maple syrup I neglected to pick up at the other Mennonite grocer (health food bulk store) coupled with a bit of vanilla extract. My knowledge of the Sanskrit language is very rudimentary. Mostly its what I picked up from studying at the Hindi Temple years ago. Maha means Great and Ananda is Bliss.... so I surmise the website to mean Great Bliss. Well this Almond milk was close to bliss for me! Enjoy! P.s. I used 6 cups of water instead of 5 so I guess it was a bit thinner but it was still yummy!